The correct design, testing, and data management are key to high purity pharmaceutical water systems. It is crucial for water personnel to understand the A to Z's of Microbial Control, Monitoring and Validation of Water Systems for Pharmaceuticals, Biologics, Medical Devices, Cosmetics, and Personal Care Products. The site's microbiologists must comprehend the microorganisms in water systems and know how best to monitor and control them. Unfortunately, many microbiologists aren't familiar with biofilm and its impact on water system sampling, testing, sanitization, and routine maintenance. This article evaluates biofilms and water systems and provides insights into prevention & control. Biofilms. The later part of this article discusses the validation of pharmaceutical water systems to help you establish pharmaceutical water purification, storage, and distribution. Biofilms are communities of bacteria that are commonly found on surface interfaces. Their populations are adherent to each other. Within these communities, there are species that secrete slime like and very adhesive polysaccharide coating. This coating strengthens the adherence of the bacteria by encouraging attachment to each other. The coating also traps the nutrients and provides a level of protection. The organisms within the biofilm go through physiological changes and take on diverse forms of sensing in connection with the environment and to each other. They also undertake different forms of communication and share genetic information within the community. Over a period, they total up to a sizeable mass. Biofilms create issues to water systems. The development of biofilms can cause an out-of-control situation. Most out-of-control situations are identifiable only from the point-of-use samples. Also, it takes several excursions to alert the probability of a biofilm. During the course of these excursions, there are even more chances for the biofilm to become considerably established. There are different stages to the formation of Biofilm. The attracted bacteria swiftly move from a reversible to irreversible state in minutes. In just a few days micro-colonies that lead to the expanded mass of established, mature biofilm form. Generally, the morphological group Gram-negative bacteria form rapidly due to the following reasons. The appendages on the bacterial cell make it easy to attach to the surfaces more easily. Microorganisms adhered to a surface within a biofilm community are the center of most microbial activity in an ecosystem, and this includes most aquatic systems. Although there is typicality in pharmaceutical well-maintained water systems, biofilms are quite atypical. A relatively low level of nutrients in pharmaceutical water systems makes it conducive for the biofilm to establish itself. The reason for this is that the nutrients have the tendency to gravitate to the surface. It is tougher for the planktonic bacterial to absorb nutrients compared with the bacteria in the sessile state. Also, the biofilm community delivers a level of defense against factors like osmotic shock. Often, despite the good maintenance of the pharmaceutical water system, biofilms are formed. What might be the reason? The poor design of the water systems. The low quality of material used for pipework and its finishing, the diameter of the pipe, the rate of speed of the circulating water or poor design of bends in the pipe where the water flow slows might cause the formation of biofilm. Sometimes, biofilms can be formed even in pharmaceutical water systems that are well established. What might be the reasons? Shutdowns or periods when water usage is low. How do you establish the reliability of pharmaceutical water purification, storage, and distribution? By monitoring and through observation over a relevant period. Despite best efforts, you might encounter problems while maintaining the chemical purity of purified water and water for injection. Thanks to the advent of using conductivity and TOC to define chemical purity. It has enabled a more quantitative assessment of the water's chemical purity and variability as a function of routine pretreatment system maintenance and regeneration. Even a well-controlled water system may deliver compromised water. In this case, just the presence of unit operations as heat exchanges and use point hoses could have compromised the water. Hence the validation must consist of the evaluation of the steadiness of the water's chemical purity over a period. Given the nature of the phenomena that occur during and after chemical purification, meeting the established microbiological quality criteria consistently is a challenge. Intensive daily testing of key process points for every unit operation, sampling point and the point of use is crucial even after establishing the operational criteria for at least a month. What is often ignored in the water system validation is the delivery of the water to its intended location of use. When the water is transferred from the distribution system outlet to the water use location using an external hose, it should is used outside of the water system. This transfer process should also be validated to ensure that the water is fit for use. "This phase of validation includes examination of equipment design; determination of calibrations, maintenance, and adjustment requirements; and identifying critical features that could affect the process and product. Information obtained from these studies should be used to establish written procedures covering equipment calibration, maintenance, monitoring, and control." Establish through documented testing, that all the important components are capable of operating within the tolerable limits. Verify and document that the water supply system provides acceptable operational control when at rest. 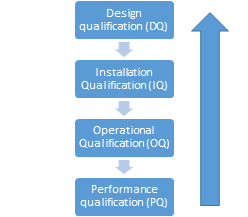 Demonstrate system consistently produces water of the appropriate quality. Phase 3 monitoring - over 12 months. Begin monitoring daily and progressively reduce the frequency based on the test data. When and where required, Implement corrective actions. Attend the seminar The A to Z's of Microbial Control, Monitoring and Validation of Water Systems for Pharmaceuticals, Biologics, Medical Devices, Cosmetics, and Personal Care Products to gain a microbiology-focused education about all aspects of water systems and how biofilm manages to thrive there. The instructor will provide the necessary background needed to understand this very important subject matter. This understanding is essential for the proper design, validation, operation, monitoring, and maintenance of a high purity water system. Without this understanding, water system control and monitoring consists of a set of rules that often don't work or result in erroneous monitoring data and can cause everything from very costly and unnecessary system downtime to patient injury and product recalls. This 2-day course is particularly relevant to managers, supervisors, and operatives taking on new responsibilities related to water, but also for experienced water personnel to learn the "true" whys behind what they do and perhaps better ways of doing things. The speaker T.C. Soli, Ph.D., is President of Soli Pharma Solutions, Inc, with training, auditing, and troubleshooting expertise covering water systems, sterilization, aseptic processing, contamination control, and microbiological laboratories. He has over 34 years of combined pharmaceutical experience as a consultant and with operating companies (DSM Pharmaceuticals, Glaxo Wellcome, Burroughs Wellcome, and Pfizer). Dr. Soli's career-long water system and manufacturing contamination troubleshooting expertise, coupled with water-related USP, ISPE, PhRMA, and PDA committee and guide creation involvements, afford him practical knowledge about process and contamination control and mitigation; cleaning, sterilization, process, and microbiological testing validation; and all aspects of high purity water systems. Dr. Soli is in his third 5 year term on USP Expert Committees responsible for Pharmaceutical Water, previously served 5 years on the Advisory Panel to the USP Microbiology Subcommittee, and helped develop the Water Conductivity and TOC specifications used by USP and adopted world-wide. He has authored many articles and chapters in books and industry guides published by PDA and ISPE and is the author of USP's Chapter <1231>.